Should Your Restaurant Invest in Pay-at-Table Technology? If you’ve ever traveled to Europe or Asia, you may have experienced paying a restaurant bill at the table. At the end of the meal, an employee brings a payment processing machine to you. You swipe, dip, or tap your card, and you’re done. It’s a quick, easy, and safe way to pay for your meal, without a lot of fuss. Slowly, some American restaurants are beginning to implement the technology as well. Some restaurants use tablets with readers to let customers check out at the table, while others are beginning to use custom-built tableside terminals. And diners seem to appreciate the technology. Sixty-one percent of diners agree that server handheld tablets improve their guest experience, according to a National Restaurant Association survey. And 32 percent of diners believe that restaurants are behind in pay-at-table technology. So why haven’t U.S. restaurants switched en masse to the new technology? It starts with American tipping culture. At the end of a meal, the server brings the check and walks away. Then the diner sets out cash or a credit card. Once the server grabs their payment, processes it, and returns the receipt, the diner can leave a tip and walk away. With pay-at-table technology, it can be intimidating to leave a tip while the server is standing over you, and restaurants and servers don’t want to risk losing tips. Countries that have been using tableside payments for years are also cultures that don’t emphasize tipping. A second reason is the additional hardware needed to make paying at the table secure for restaurants. Even now, only 42 percent of restaurants are currently using EMV chip technology, which protects restaurants against fraudulent and counterfeit payments. And technology that allows business owners to accept chip cards is quite reasonable (Square Reader for contactless and chip is only $49). Tableside payments make payments more convenient, especially when it comes to splitting the bill. It’s much easier to split the payment by order and pay individually at the table, instead of having one friend put the tab on their credit card, and everyone adding up their orders, taxes, and tips to send to the friend via Square Cash. Maybe that’s why nearly a third of millennials look for advanced technology when dining at restaurants. In a traditional payment experience, a server brings the customer a check. Then they come back to collect the check with payment. If the customer uses a card, the server has to run the card at a station and then bring back the card and receipt for signature. All of those steps can take a good chunk of time. Tableside payments, on the other hand, cut down on all the back-and-forth and allows your diners to pay more quickly. This means a better experience for your diners — both those who have finished eating and those who are waiting for a table. A faster checkout also allows you to turn tables more often. Though it may seem like pay-at-table technology might bring about awkward interactions when it comes to tipping, it might actually help servers increase tips. You can use the technology to cut down on the time it takes to pay, and who doesn’t love a quick and smooth experience when they’re done with their meal? Additionally, the tableside payment device can offer tip suggestions, which help customers (no more doing math on a napkin) and may result in higher tips. 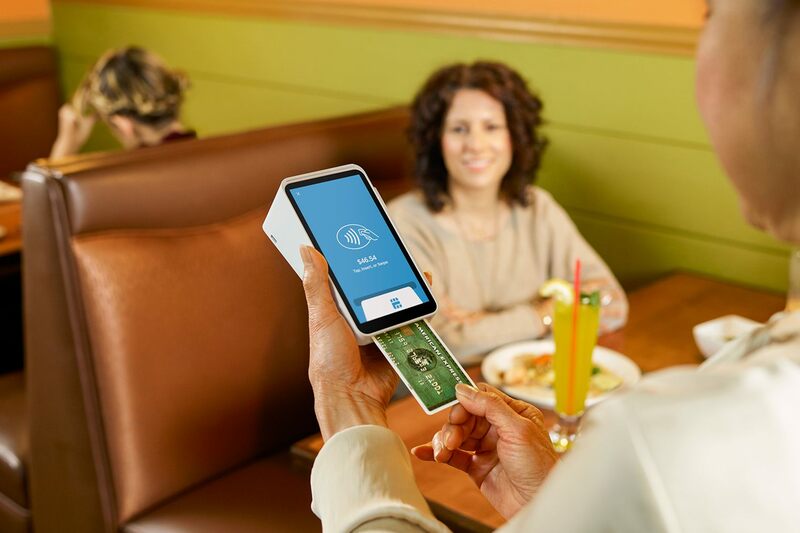 Most tableside payment technologies come equipped to process all types of payment — including chip cards and contactless payments. That not only allows your customers to pay in whatever way they want but also means that you’re using more secure payment methods and you’re EMV compliant. While customers might not realize how secure those payment types are, they will likely appreciate that tableside payments mean that their card never leaves their hand. This helps them feel more secure as it protects their personal information.